The widening and reconstruction of the I-77 bridge is part of ODOT’s Cleveland Innerbelt Modernization Plan. As part of the Cleveland Urban Core Projects, the Ohio Department of Transportation (ODOT) has what it calls the Cleveland Innerbelt Modernization Plan. 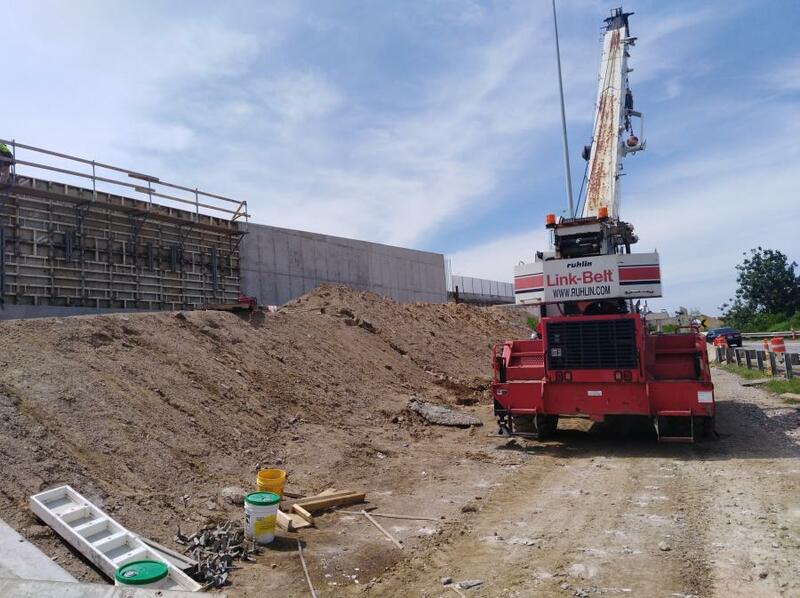 One of the initiatives in the work is the widening and reconstruction of the I-77 bridge over I-490 and the improvement of I-77 south of I-490 — a $25.6 million contract that was awarded to The Ruhlin Company. The ongoing I-77 work has not been easy, but the Ruhlin project team and crews are tackling any obstacles that come their way. The work will see the current I-77 bridge (one southbound and one northbound 420-ft.-long structures, two lanes in each direction) demolished and replaced with a 510-ft.-long bridge that has three lanes in each direction. The other road work includes 700 ft. of approach roads on either side of the new bridge, along with ramp roadway replacement and improvements. The work started last October and is expected be completed in October or late fall of 2019. This project is being financed by state and federal funding. The old bridge was built in 1964 and carries 71,400 cars and trucks daily. The new bridge was designed by Richland Engineering Limited. The I-77/I-490 interchange has four levels — level one (lowest level) is I-490 (six lanes of traffic), levels two and three are system interchange ramps and level four (top) is I-77. The existing vertical clearances between all these levels are substandard. 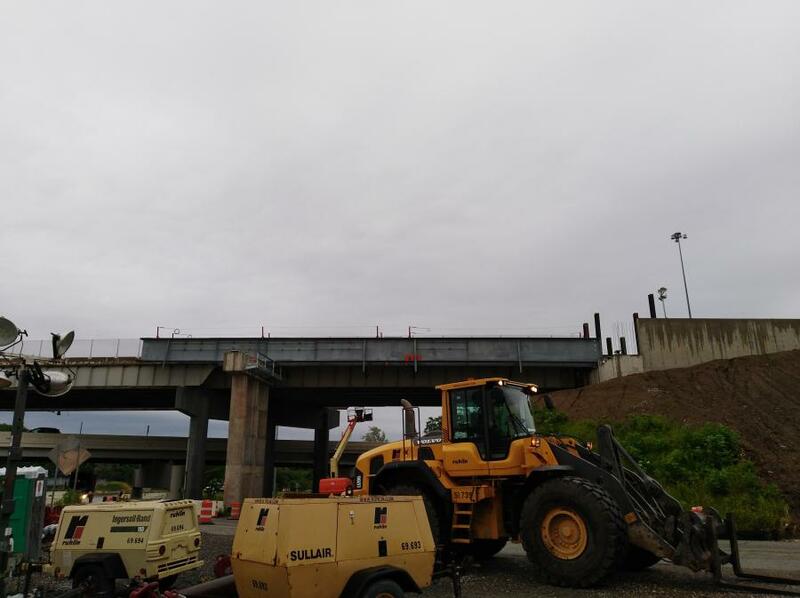 “We had to ensure the new bridge had sufficient vertical clearance to accommodate replacement of the ramp bridges at their proper vertical clearance,” said James Calanni, an ODOT transportation engineer. “So instead of increasing the vertical clearance by 1.5 feet over the level 3 ramp, we increased the vertical clearance by 6.15 feet. This resulted in the profile of I-77 being raised significantly, but the profile couldn't be raised too much because we had to meet the profile of the Kingsbury Run bridge to the north and get under the proposed Broadway Avenue bridge to the south (and maintain proper vertical clearance). Calanni noted that while the hybrid girders are not a new concept, they are not used too often because most highway bridges do not have the girder depth and clearance challenges that ODOT faced with this bridge. 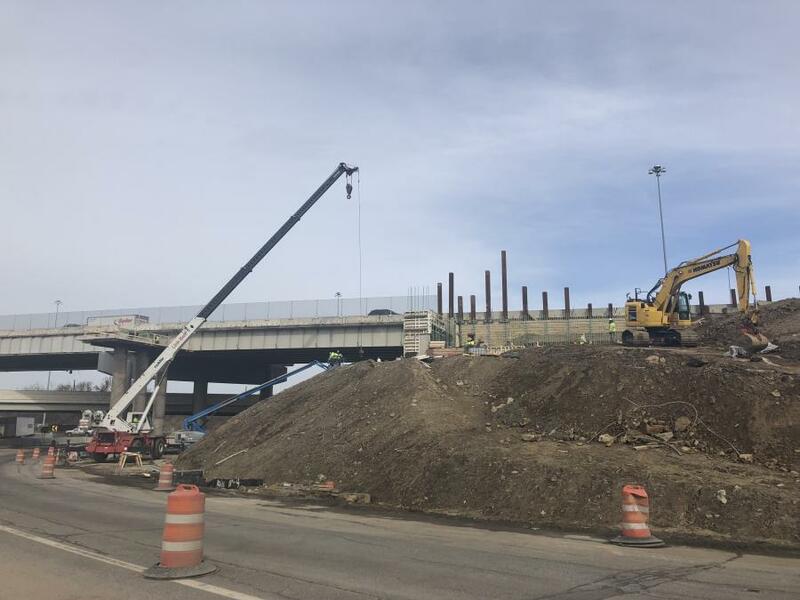 The work has impacted traffic year-round as the work proceeded over the winter; Ruhlin crews temporarily closed some lanes on I-77, as well as ramps at the I-77/I-490 interchange, in order to accommodate demolition operations during the winter months. Thus far Ruhlin has completed partial demolition of the outside parapets and girders from the existing bridge and begun the outside approach roadway work. Piling and substructure construction is complete for the Phase 1 portion of the project and steel erection is underway for the superstructure. Jackie Guttman, Myers' assistant superintendent, handles a lot of the detailed coordination considerations to schedule the work. The team also includes: Greg Eichler, project superintendent; Dustin Shifferly, general labor foreman; Mike Moser, carpenter foreman; Chris Baumhoer, chief project engineer; Scott Cooper, structural steel superintendent; Jerry Sloan, pile driver foreman; and Steve Revay, iron worker foreman. Other challenges include the tight workspace. An on-site construction office was set up nearby to help manage the day and night work that is ongoing. Another unforeseen challenge has been the soil conditions which affect pile driving. “It has created a delay which might push the project out an additional month,” said Myers. “We're working with ODOT, which is selectively directing us to accelerate by working some overtime in an effort to recover the schedule. “There are areas where the piling had to be driven deeper than anticipated, which required additional set-up periods or wait time to allow the piling to gain the required capacity,” he added. “We're driving 16-inch diameter cast-in-place pipe piles. Some had to go down 90 feet and when we reached that depth, we didn't have the prescribed bearing and we had to drive them down another 40 feet. After this we still didn't have the capacity. So we had to give it additional set up/wait time. These are all friction pilings and rock was not shown anywhere on the borings. The steel girder erection, with the challenge posed by the ramp bridges below the new bridge, require the use of large hydraulic cranes to do the demolition and removal of the existing steel beams. Ruhlin had time to plan the project schedule between the time of the bid phase and start of the construction. There are currently about 30 construction workers, along with five plus support staff on site. The major subcontractors are: Armstrong Steel for reinforcing steel; Karvo for asphalt; Miller Cable for highway lighting; RAR Contracting for concrete delivery; Follow the River for SWPPP inspection and erosion controls; A&A Safety for maintenance of traffic and striping; M.P. Dory for traffic signs and sign supports; and Lake Erie Construction for guard rail. Stupp Bridge fabricated the new steel girders, and they were metalized and delivered to site by Ohio Structures. Materials removed from the site should total 1,500 tons of steel and 2,000 tons of concrete. New materials should include 3,000 tons of steel; 7,000 cu. yd. of concrete; and 16,000 cu. yd. of asphalt. The work site is close to Ruhlin's shop and mechanics are sent in as needed to deal with typical wear and tear issues. The crews are using Link-Belt 218 and 138 crawler cranes for pile driving; an I-19 pile hammer; Cat 336 excavators, one of which is equipped with a Movax SP100 steel pile installer; a Komatsu PC228 excavator; a Cat D6 dozer; and a Volvo L120 loader. The cranes will be rented from Maxim Crane Works. Ruhlin purchases its Cat equipment from Ohio Cat and piling equipment from HMC. Other projects in the Urban Core program include the Opportunity Corridor and Lakefront West initiatives.